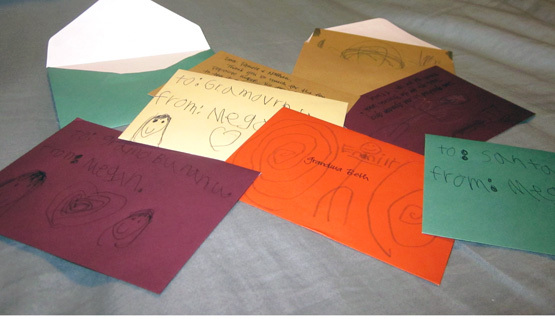 We all want to teach our kids to be grateful and the gift extravaganza of this last week is the perfect opportunity. 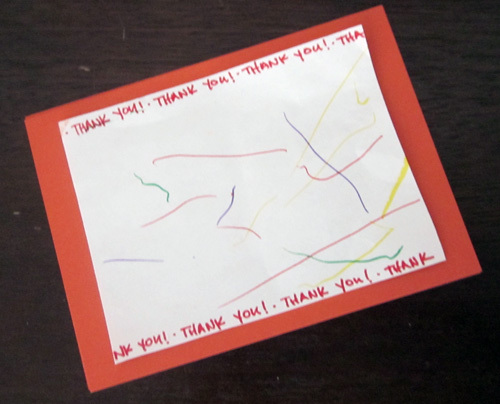 Head on over to Today’s Mama, where I am sharing some tips for making homemade thank you notes with your kids (no matter what age they are). Last Thursday we headed over to This Is The Place Heritage Park to rock Christmas old school (thanks to the nice folks at Today’s Mama, who offered us tickets.) I wasn’t sure what to expect or how much my little and often impatient girls would like it (our visit to Temple Square was very brief); but we had a fantastic time. They were dissapointed when the park closed and they couldn’t have one more train ride. (Which they loved even though, as Megan informed us, it wasn’t a real train because it doesn’t run on a track.) 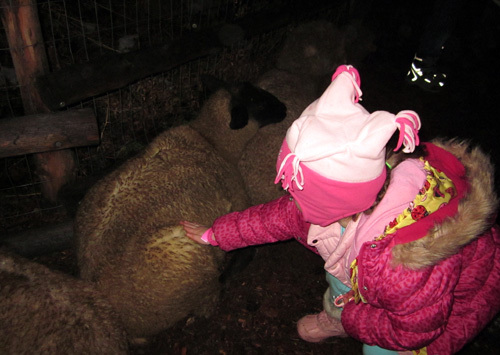 Other highlights included meeting Father Christmas and getting an up close look at real reindeer as well as a stroll through Elf Village. 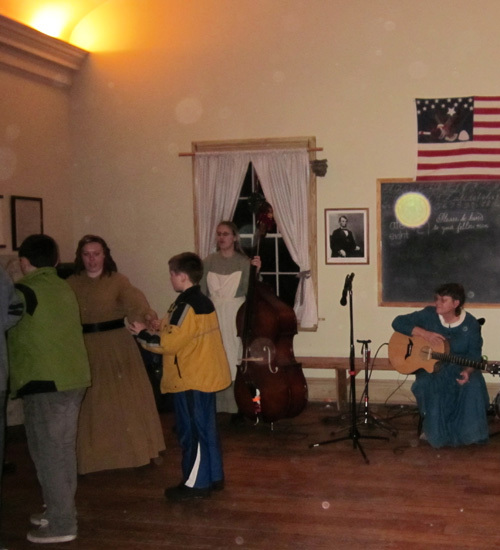 It is fun to walk around the grounds, then slip into one of the houses to warm up and do a period craft or activity. The girls and I learned Georgian/Victorian dances like the Viginia Reel and Pat-a-Cake Polka. I think they would have stayed in this house all night. We loved it. My favorite part was the live nativity. It was so beautiful. A Wiseman guided us down the path to the stable then we saw the shepheards (who had real sheep and the sweetest little goat that we got to pet). The only thing that would have made it better was if they had told their story. (Maybe that would have gotten old for them though.) All in all, very cool activity. We got there at 7:00 and I really wished that we would have made it there right at 6:00 so we had more time. Their Candlelight Christmas runs until the 30th, I recommend that you go, and go early enough to do lots of the fun stuff. I also wanted to post about Temple Square. It is dazzling and beyond the millions of fairy lights twinkling fron tree branches, there are dozens of beautiful nativities–which I love. You can’t beat the reverent feeling of gazing over the reflecting pool at a life-size Mary and Joseph or wandering among the large nativity sets from around the world. However, our pictures have mysteriously disappeared. So I guess I will just say go see it. We only stayed for about a half hour (including a painful tantrum in the bathroom of the visitor’s center.) 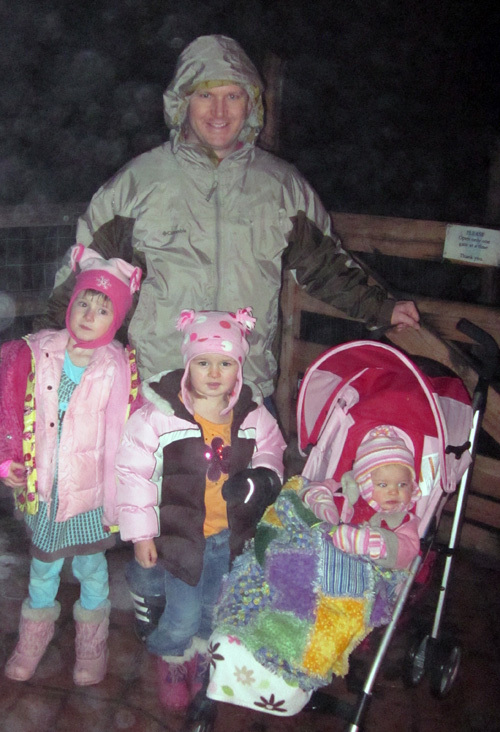 We were pretty stressed by the time we left, but it definitely is worth it and I think it will be more enjoyable once the girls get a bit older. What are your Christmas must-see destinations? Do you still do Christmas up until New Years or are you ready to take down the tree? I love Oreo Truffles. They are easy, but a bit time consuming. Mmmm, if I drop this off personally, will you trade me for truffles? Just kidding, Kristina. I will email you to find out where to send this little kitchen helper. It has been fun counting down some good gifts with you guys. Hopefully you are ready and having tons of fun and Holiday cheer! Merry Christmas! I feel like I took quite the little vacation there. But I needed it; now that I am caught up with the real life stuff (um, Christmas anybody??) I am feeling a lot more in control. I think I am ready for the big day; how about you guys? Ho Ho Oh No stress or just tying the bows up at this point? I am glad I still have a couple more gifts up my sleeve though. It has been so much fun to do these giveaways. I’ve used an x-acto knife for just about anything. I keep one in my purse at all times, and you never know when it might come in handy. It’s great for screws and, of course, cutting things, and you can get the pointy end in the smallest holes and cracks. It’s a little dangerous, though, and I’ve got the scars to prove it. 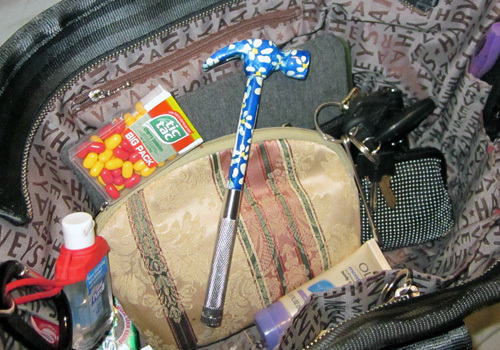 Maybe that cute hammer would fit in my purse too? Granted, my purse is definitely big; but doesn’t it look happy there? Emily, please email me your address so I can get it out to you and stop thinking about keeping it for myself. : D Congrats! Good things come in small packages and hand-made is no exception. Use a combination of easy to find craft embellishments and your child’s artwork along with polymer clay to make little trinkets that are sure to be treasured. Head on over to Today’s Mama and I’ll show you a few fun ideas. I couldn’t remember so I had to go through photo albums and check. Our last official family (with no extended family) picture…taken by a person who is an actual photographer…was 1999. Even then, it was taken in the Target Photo Studio, probably by some teenager. We have had gracious family, friends and neighbors take pretty decent pics since then, but we haven’t had a “photographer” take our picture in 11 years. Last Christmas we tried to do it ourselves. Not so great…glare off of the fire place, bad…self timer shot…bad. Anyway, I think we are due! I think she deserves it! 11 years is a long time to go! Although I know she has had some really qualified stand-ins. 😀 Congrats Kristine. I will forward your email to Stephanie and she will give you instructions on how to redeem. This is a fun one! I love to make these for friends; the votives look so beautiful lit up. You can make them simple and sweet or over-the-top intricate and stunning. 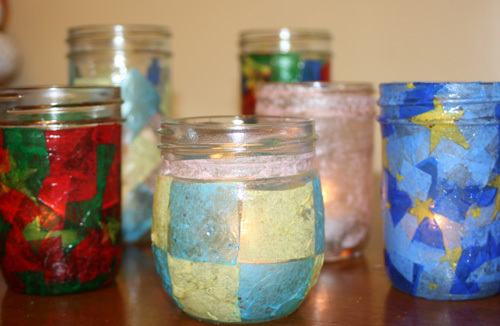 Either way, just a little tissue paper and a glass candle holder or even 1/2 pint jar will transform into a great gift. So head over to Today’s Mama and make one or three today! I loved the strawberry notes! Congrats! I hope you enjoy them. I have forwarded your email address to the creative folks at Sweetlife Paper and they will contact you shortly with instructions. At a party the other night, we were talking about how much we love this season because you get so many delicious goodies. For someone special, you can take the treat tradition to the next level by placing those goodies in a mixing or serving bowl that they will enjoy using the rest of the year. I highly recommend a batter bowl. It is always well used, the first thing you reach for to whip up cookies, pancakes, or filling for pot pie. (Hungry?) Pampered Chef makes one that I have really enjoyed, but I found this one by Pyrex for less than half the price (about $7). I like that it has the measurement marks set so that you look down into the bowl to read them (versus looking on the side). A nice ceramic bowl or one of Ikea’s mixing bowls would also be great. This really is the perfect last minute, easy to do gift. 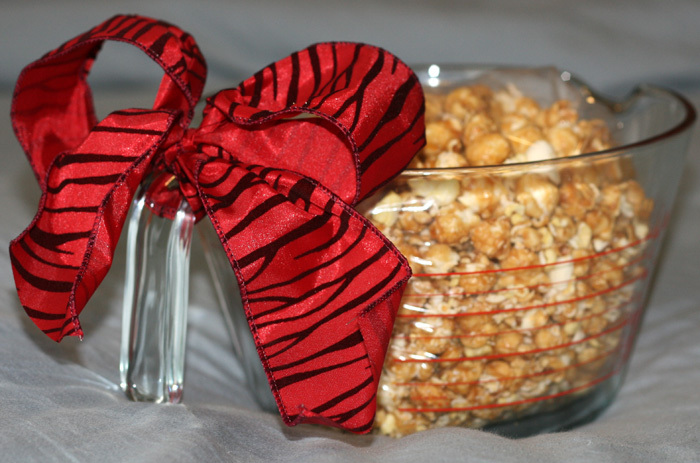 Just fill it with some white chocolate or caramel corn (or whatever) and tie a bow on the handle. Perfect. I will send this Pyrex bowl to you to use for yourself or pass along to a friend. 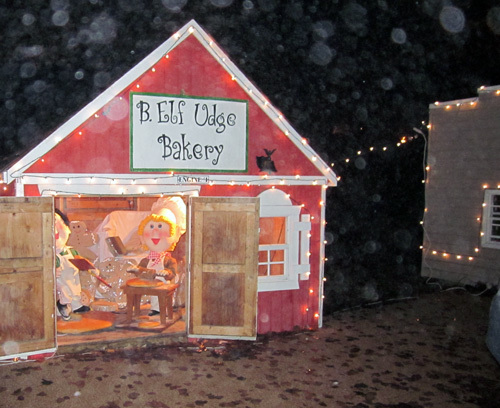 To enter, leave a comment telling us what your favorite quick and easy treat is by Monday, Dec. 20th. *Extra entries can be earned by blogging, tweeting, or posting on Facebook (with links) about this giveaway. Please leave a comment for each additional entry. The winner will be chosen by random.org and announced on Tuesday Dec. 21th. Good luck! Did you enter to win? Susie, please email me with your address and I will forward it to C.D. Childs to send that package your way. Hope you enjoy!